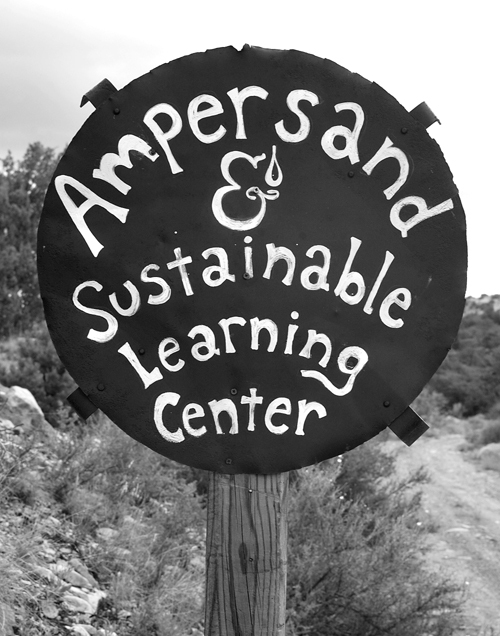 Ampersand Sustainable Learning Center is an intriguing mixture of teaching space, collective building, embryonic community, and a remote eco-home. 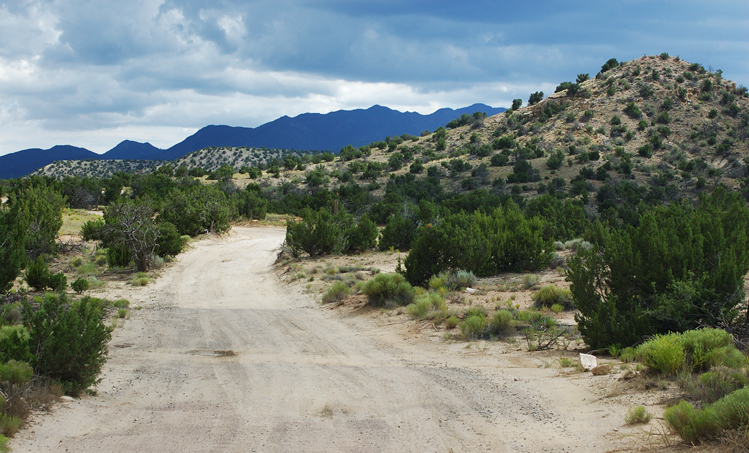 Situated south of the small town of Cerrillos in New Mexico, Ampersand is at the end of several tracks snaking into the hills. 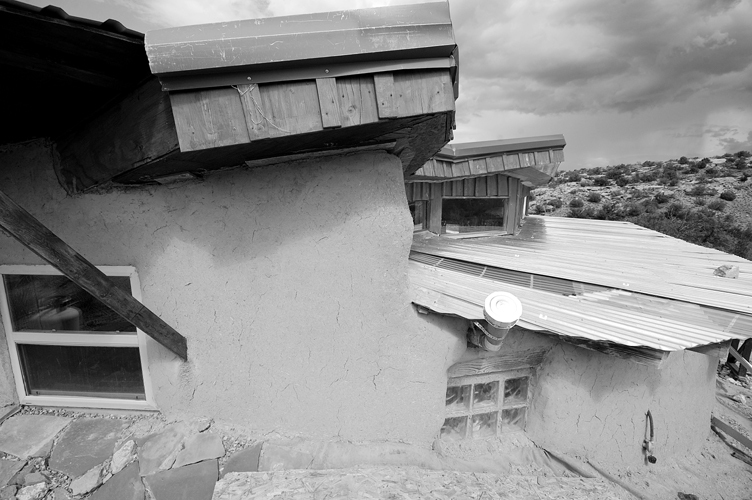 In construction since 2003, the buildings here are mostly hybrid, a mixture of straw-bale walls, adobe and earth bags. 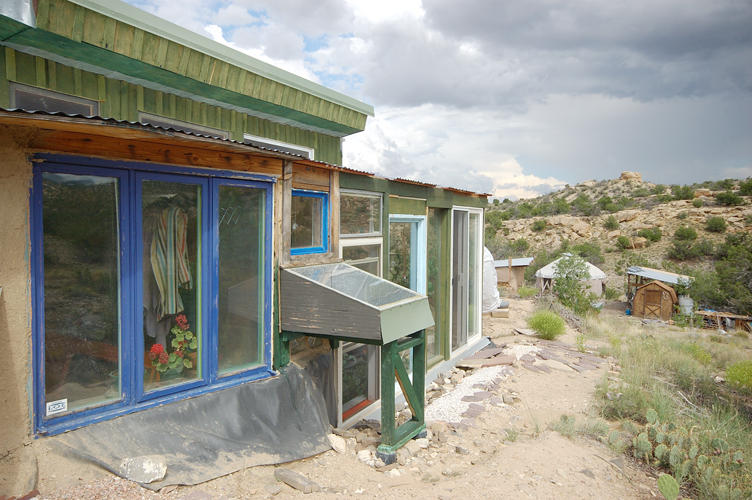 Many things have been fashioned from reclaimed items such as salvaged windows, reusing wood, or using an old swivel office chair as a base for a solar oven (thus being able to move it to best catch the sun). 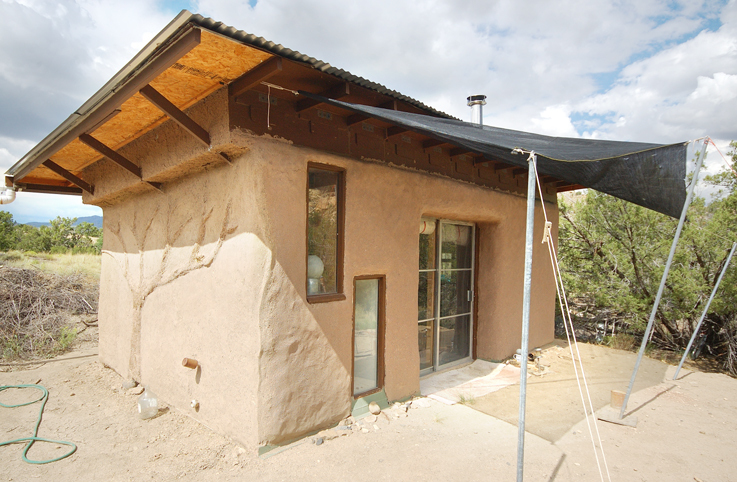 There is a main house – the home of Andy and Amanda Bramble – and then other more collective spaces such as a straw bale guest house, an outdoor kitchen for guests and another guest building to which a new bathroom was being added. 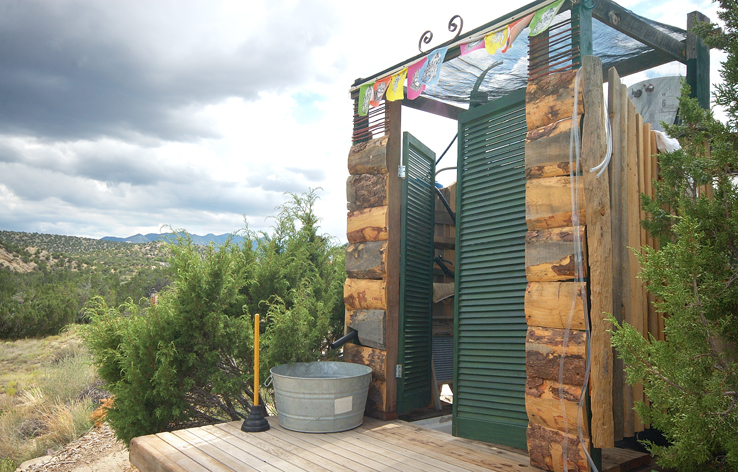 There is also an outdoor solar shower. All the spaces are compact – making use of sleeping platforms, open plan design, and careful placement of furniture – and there is a beautiful simplicity to many of the rooms. There is enough for comfort but not clutter and certainly not an excess of things. This simplicity is also evident in the way everything is designed to be efficient and minimise waste. 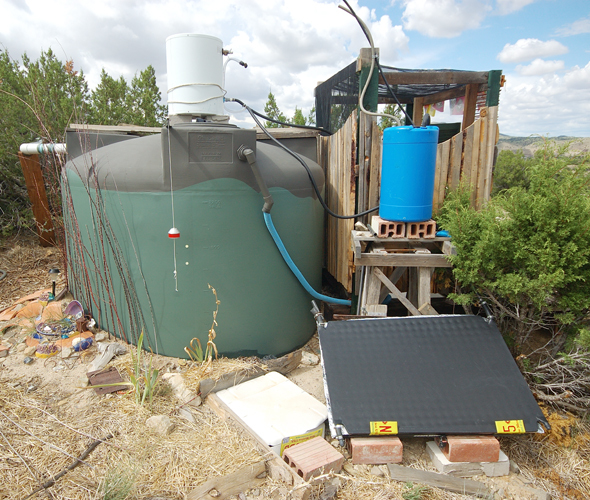 For example, the solar thermal hot water panel is just outside the bathroom meaning it does not have to travel far to the point of use, and they feed used water into the indoor planter to water the growing vegetables – making multiple uses of what they have. Ampersand is completely off-grid – generating all their electricity from photovoltaic panels, using solar thermal to heat water, collecting all their water via rainwater (into a 2,500 gallon tank) and using a solar oven for cooking. They also warm and cool their house passively. 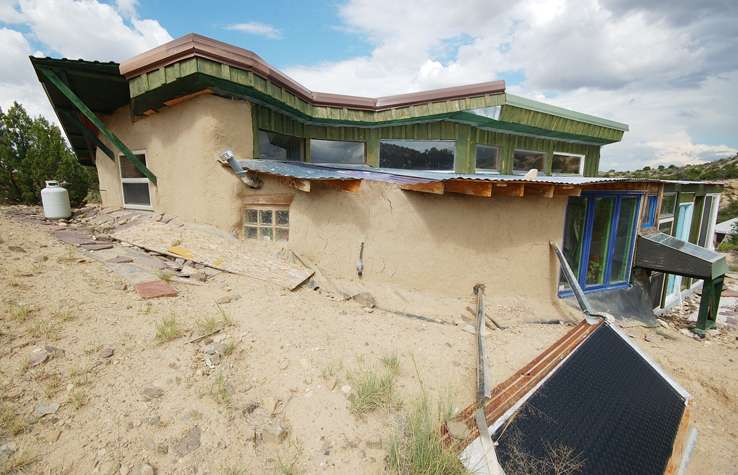 The back of the main house is built into the ground with only a couple of very small windows looking north from the pantry. To the front they have a greenhouse, as this heats up they let heat in through internal windows and when it is cold outside the greenhouse acts as a barrier while still letting the sun in. Their water use also is extremely low, about six gallons each per day. Water is then filtered through a Big Berkley system ready for drinking. Growing food out here is difficult so they have built a large greenhouse to the front of their house with an indoor planter and created a large storage space – a pantry built into the ground at the back of the house. 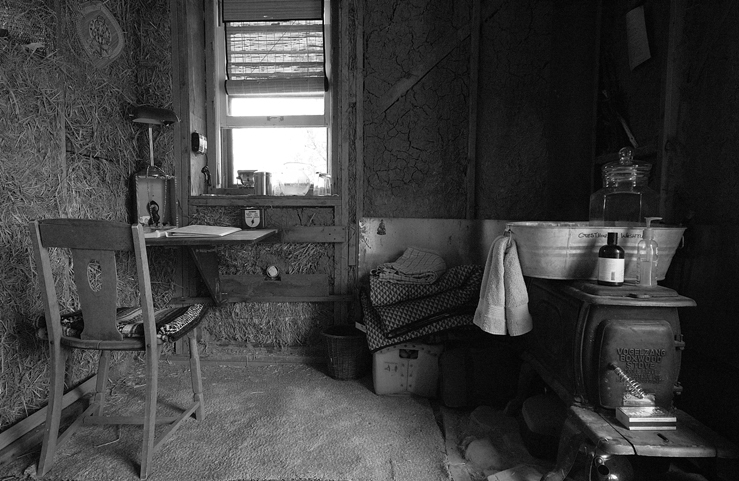 Refrigeration is limited, they “we harvest ice from an open-topped cistern in the winter to keep our food cold” (p.154) but have to use a propane powered fridge at times in the summer. 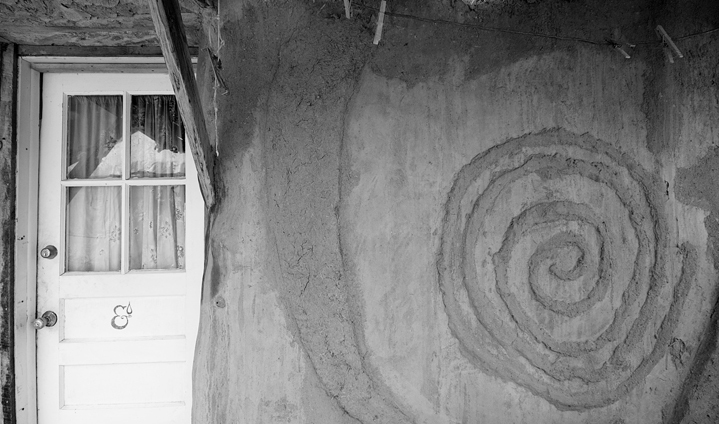 Ampersand aims to demonstrate “low-tech sustainable systems which people can do themselves, so that they are not reliant on experts” (Amanda Bramble). There is an emphasis here on having the skills and courage to do it yourself and key to this is starting small and simply learning through the experience of building small structures. 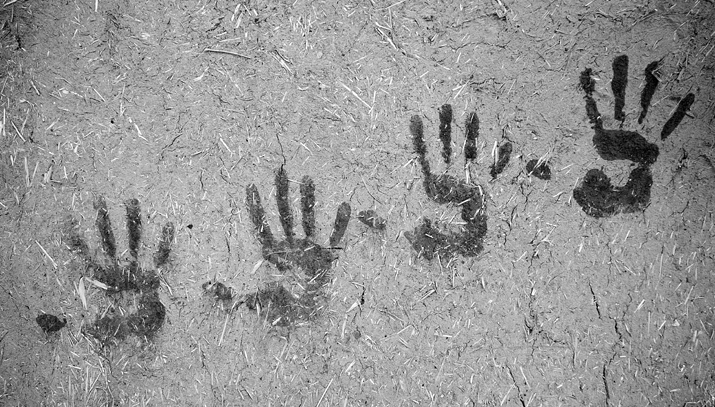 It is also about building as a collective endeavour. I can’t help but fall in love with the simplicity of some of the design and materials used here. 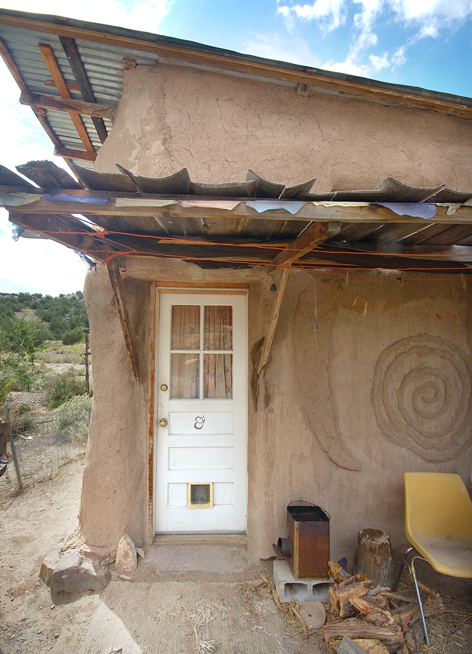 In the straw bale guest house there is everything you need and no more or less. Everything is low cost, reclaimed, salvaged, adapted and yet it all has a beauty too. When I asked Amanda what barriers might exist in getting mainstream society to understand and value a place as eclectic as Ampersand she argued that the main obstacles are the “mental constructs of what is acceptable beauty and lifestyle”. 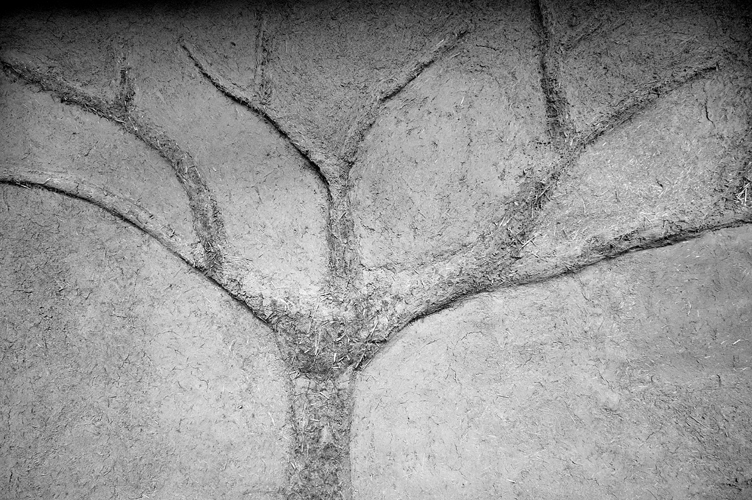 Of course it can so easily come down to one’s own choice of aesthetics, but to me this is a place made for the future.